Riesling is King of the German wine industry. When anyone mentions “German wine,” it is the first grape that comes to mind. Riesling is planted in all thirteen official wine-growing regions of Germany (called Anbaugebiet). The wines that we mostly see here in the United States come from the regions of the Rheingau, Mosel and Pfalz. My visit to Germany and these regions was to deepen my understanding of the area differences. Riesling has been able to preserve its varietal character wherever it is planted. Differences in terroir are strongly reflected in its wines, creating wonderful diversity within the Germany Riesling category. The Rheingau is often overlooked (Mosel has done a better job in promoting itself), but is regarded as the most famous and noble of German wine regions, with vineyards placed all along the majestic Rhine River. Located near Frankfurt and Wiesbaden, the Rheingau is home to Geisenheim, Germany’s internationally famed viticultural institute. The Rheingau region was one of the early promoters of dry Riesling and instrumental in promoting the Erstes Gewächs (First Growths) Classification of vineyards, which is the apex of the quality pyramid by which German wine is classified. The wines of the Rheingau have more backbone and structure with firmer minerality, and greater richness and body. Here, the dry style really sets itself apart with wines of intense flavor and concentration, focus and length, especially those made from the steeper hillside vineyards. Many of Germany’s most renowned Rheingau estate vineyards are located in the famous villages of Rüdesheimer, Johannisberg, Winkel and Eltville. 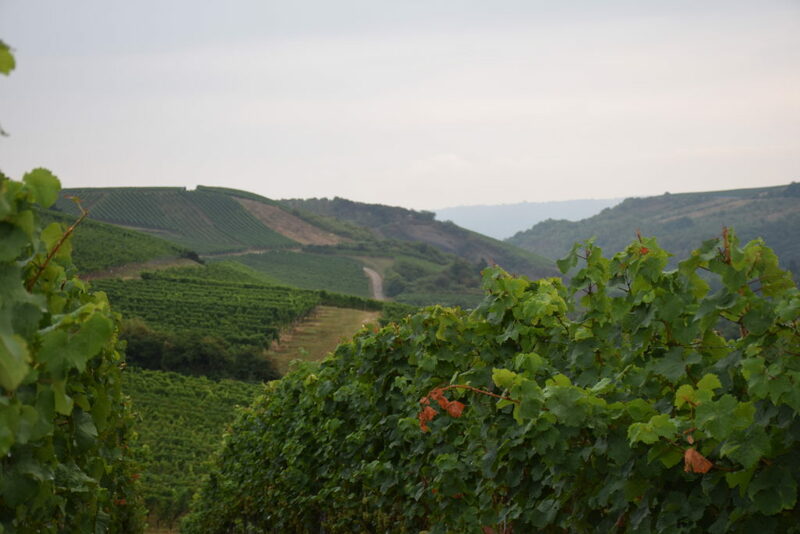 After arriving in Frankfurt, Germany on Monday morning after an uneventful, overnight flight from New York, we hopped in our rental car and headed to our first visit in the Rheingau. Only a thirty minute drive on the Autobahn from the bustling city of Frankfurt lies the town of Oestrich-Winkel. Here we would make our first visit to the estate of Weingut Spreitzer, which has been operating since 1641. 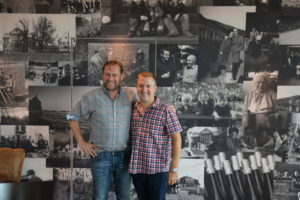 We met up with super friendly Andreas Spreitzer, co-owner of Weingut Spreitzer with his brother since 1997. Andreas shared the history of the estate and showed us on a map in the tasting room, the estates vineyard holdings. Usually when visiting an estate, you taste the wines in the tasting room or cellar. For us, it was going to be more hands on and different. Andreas grabbed the wine samples and the keys to his SUV, and we headed off up into the vineyards. 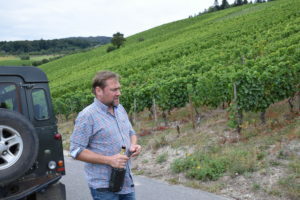 At the various vineyard holdings, Andreas would taste with us the wine from that particular vineyard. Amazingly, you can understand a real sense of place when tasting wine this way. You see the landscape, smell the air, feel the soil and taste the grapes but most importantly, you taste the style in which the estate chooses to express the grapes they grow. The Spreitzers viticulture practices are as natural as possible with alternating cover crops of herbs and lentils in the summer to grains in the winter. The family strives to maintain fruit and finesse by cleaning the must (juice) by gravity for 24 hours after whole-cluster pressing. Then they let the wines rest on their gross lees and filter the wine only once. The employment of a long fermentation and extended lees ageing helps to protect the juice from oxidation and maintains the wines freshness. Mostly ambient yeasts are employed for fermentation in both temperature controlled stainless steel and 1200 liter casks of German wood, called stückfass. The result are wines that show great salinity, length and pedigree. The sweetest surprise was that of the dry Riesling. Yes, Riesling can also be dry, as it has increasingly become in Germany and as Rieslings mostly are in the rest of the world. The Riesling we tasted were not only dry but also delicious, with a crisp, almost effervescent brightness to it. This rare versatility, which permits Riesling to beautifully express styles ranging from bone dry to captivatingly sweet, is another of Riesling’s singular characteristics. Riesling has the ability to age for decades, to make wines that are intense yet delicate and to express the intricate nuances of terroir so beloved by wine geeks, regardless of whether the wine is dry or sweet. Germany, the ancestral home of Riesling, is where more of these styles are on dazzling display. In the Rheingau, we also had the privilege of visiting the estates of Robert Weil, Kruger Rumpf, and Donnhoff and Diel in the Nahe. We left the region with a very rewarding experience and felt the anticipation and excitement for the rest of our trip. Next stop, the infamous Mosel Valley.